Operators: Bgancev I., Izvekov V., Kuznecov I., Maksimov L., Semin V., Filatov I. About the meeting of Konstantin Chernenko with the electors of Kuybyshev district of the capital ( Moscow). 1-3h. Meeting Chernenko voters in the Kuibyshev district of Moscow in the Kremlin Palace of Congresses. Speech trustees Chernenko calling on voters to vote in elections to the Supreme Soviet of Konstantin Chernenko. 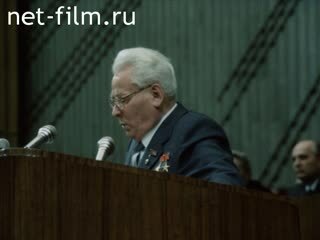 This Chernenko on Soviet foreign policy, etc. The Kremlin, Moscow - LS., PNRM. (Top). The Supreme Soviet of the USSR, the flag on the building? Palace of Congresses - MS., LS., PNRM. 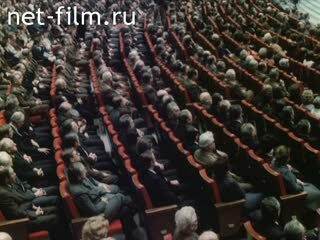 Voters go to the Kuibyshev election district of the capital for a meeting with Secretary General of the Central Committee, the candidate of the USSR Supreme Soviet Konstantin Chernenko. Are members of the presidium of the meeting, the voters chant - MS., PNRM. (With motion). 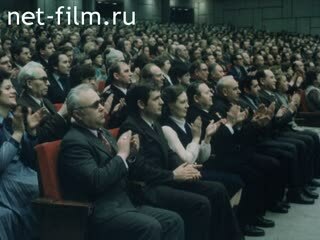 Konstantin Chernenko, Mikhail Gorbachev, Andrei Gromyko, DF Ustinov, and other members of the government presidium, applaud - CU., PNRM. Moscow: a stream of cars, people on the street, at home - MS., LS. Building "Elektrozavod" said trustee candidate to the USSR Supreme Soviet Konstantin Chernenko, the foreman of an integrated team of the plant AP Litvinov (synchronous); PNRM. with details on the AP Litvinov. From the platform of the Kremlin Palace of Congresses are: AP Litvinov, Professor Dyatlov, plant manager "Hromatron" car Lukasheva teacher, First Secretary of the Communist Party of the Kuibyshev district A. Prokofiev (synchronous) - Various., PNRM. Acts Konstantin Chernenko (synchronous) - CU., Departure. The presidium meeting with voters Kuibyshev district of Moscow, Konstantin Chernenko, Andrei Gromyko, Mikhail Gorbachev, DF Ustinov, and other members of the government, applauded. From the platform of the Kremlin Palace of Congresses says Konstantin Chernenko (synchronous) - Various. Voters listen, applaud - different., PNRM., Departure. Of the floor, Konstantin Chernenko (synchronous), leaves - different., Impact., PNRM. At the podium: Mikhail Gorbachev, Andrei Gromyko, D. Ustinov, and other members of the government, applaud, listen - different., PNRM.